The Capital Crescent Trail is an off-road shared-use path that forms a crescent as it travels from Georgetown to Silver Spring via Bethesda in the Georgetown Branch right-of-way. Montgomery County purchased the right-of-way between the DC Line and the CSX tracks just west of Silver Spring in 1988. M-NCPPC has jurisdiction over the portion between the DC Line and Bethesda and the Montgomery County Department of Transportation has jurisdiction over the portion between Bethesda and Silver Spring. In 1990, the National Park Service acquired the Georgetown Branch from Georgetown to the DC Line. The Capital Crescent Trail is currently paved between Georgetown and Bethesda. 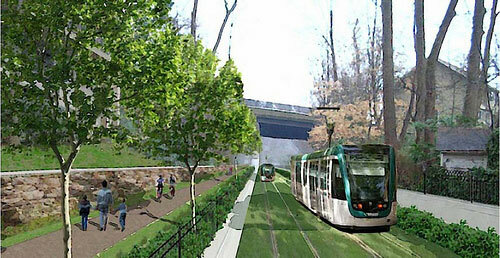 Between Bethesda and Silver Spring it is currently called the Interim Georgetown Branch Trail. It has a gravel surface between Bethesda and Lyttonsville and is on-road between Lyttonsville and Silver Spring. The current project will extend the Capital Crescent Trail as a paved off-road shared use path from Bethesda to Silver Spring in conjunction with the Purple Line light rail project. This segment will typically be 12 feet wide with 2 feet unpaved shoulders on each side. It will serve a recreational and a transportation function, as well as providing direct access to both the Purple Line and the Bethesda and Silver Spring Metrorail stations. The Capital Crescent Trail extension is a Montgomery County project, funded by Montgomery County and designed by the Maryland Transit Administration.